These two, Andrea and Mike Jones are something special. They have worked very hard to develop a new group fitness concept for the Twin Cities that combines high-intensity interval training, concepts that have worked in a CrossFit program and power vinyasa yoga. After visiting their studio yesterday and experiencing it, I left feeling energized, inspired, strong and yes, sore! Andrea made sure all of her athletes were ready to go and in the room before we started. We began in a circle at the front of the room around a chalk board. She introduced herself and had us go around in a circle and introduce ourself. The community all seemed to know each other and were very friendly, encouraging and never intimidating. Andrea then explained and demoed a handful of exercises we would be doing later on our own, then told us to grab a “slam ball” and then spread out. My inner competitive swimmer itching to escape unleashed and I closed my eyes in mountain pose. We began by doing an energetic power vinyasa flow warm up and held various postures for a few breaths. The teaching style was different for me, but I liked it! Plenty of cueing and instruction so if you were completely new to yoga, have no fear, Andrea has got your back! Then before I knew it, she was starting the clock, turning up the music and it was GO TIME! For 10 minutes, we worked very hard with that slam ball… we did ball slams, squat throws, slam ball toe-touches and russian twists as hard as we could for 10 minutes. After that, everyone celebrated, cheered each other on and passed out high-fives. We were not done yet though, next we did a powerful standing vinyasa flow sequence without weights. At the end of class we slowed down, did some deep stretches and ended in savasana, corpse pose, final relaxation. I’m happy to introduce you to my new friends, Andrea and Mike Jones. These two are incredibly positive, motivating and down to earth with their philosophies behind exercise, health and well-being. What inspired them to do what they do is each other and their athletes, I had to ask them a few questions and interview them! How did you get started creating your passions into a business? How did Alchemy 365 come to life? Andrea: I picked up The Alchemist, by Paulo Coelho in 2003 not knowing that it would change my life. Working as an intelligence analyst at the time, I carried my Brazilian dictionary and copy of the Alchemist with me for weeks, carefully translating its words and processing Santiago’s journey while working abroad. A dozen years later, now operating under the business name Alchemy, the story still hits home and continues to push me to try new endeavors and overcome fears. These are the top three lessons I learned that are still explicable today.. Follow your passion, take action and enjoy the journey. Discovering your Personal Legend is like honing your internal compass. That being said, we may stop and reorient but we always march forward. The hardest part is taking the first step. Alchemy is my new path. It drives my passion to make a credible group fitness that delivers results accessible to the masses. Mike: We moved to Minnesota so I could work for 3M as a marketer, and Andrea became a personal trainer at Lifetime. Seeing her excel in a new career was probably what made me confident we could succeed when I got into CrossFit and considered starting the first CrossFit gym in St Paul. Alchemy is an evolution of the past six years of observation and implementation of training programs for thousands of people. 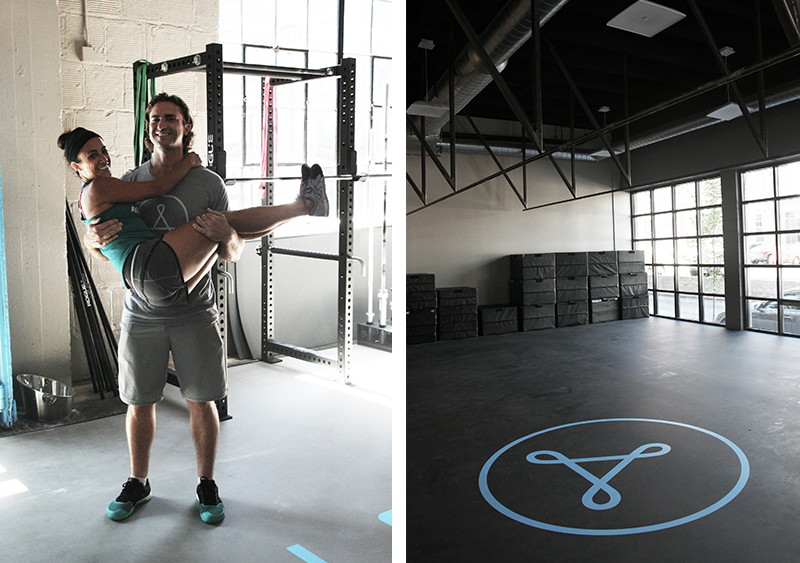 We lacked the balance of yoga and the polish of a boutique studio in our CrossFit program. Adding those things and making them a standalone offering with its own look and feel is where Alchemy came from. How would you describe the A10/A20 class? Why have you blended strength and conditioning, yoga and cardiovascular training? Andrea: In short, it felt like the complete package. Mike: High intensity interval training or circuit training is popular because it works. CrossFit uses it, bootcamps use it, athletic programs at universities use it. We took that concept and tightened things up in a format that is accessible to all people by making each workout a set period of time (10 or 20 minutes), and surrounded it with yoga, which helps balance out an athlete’s training and build flexibility and joint health, along with recovery and mindfulness into the equation. Add the group dynamic, fun music, in a cool environment, and you have a class that makes people fitter and makes them want more. The only thing missing from the equation is strength training, which we separated out into its own class – AStrong. What are some of the health benefits of this method of exercise? How does this method of group fitness show results for your athletes? Mike: Improved endurance, flexibility, strength, power, coordination, balance, along with improved confidence from tackling challenging workouts that bleeds over into everyday life. Improve these elements of fitness and the appearance benefits that most seek will follow. What advice do you have for someone that is new to this? Are these classes accessible to beginners? Andrea: Yes of course, coaches have time to check in with you, help with alignment and challenge you. Our rooms do not have mirrors and are not heated, intentionally. Mike: Absolutely! All movements used in an Alchemy workout can be done by beginners. I’d recommend new people start with an A10 class, all you have to do is look at the schedule and show up a few minutes before your first class. For those who would like a slower pace or a bit more explanation, we have a Free Intro Workout every Tuesday at 7pm. How do you encourage your clients/ athletes to stay motivated and challenge themselves in your classes? Andrea: We have a specific style of cueing and instructing the classes. Our coaches are able to have more time to encourage, motivate and speak directly to the students. During that 10 or 20 minute high intensity interval training the athletes are receiving intentional cues that are specific to them. Mike: The nature of the workouts forces people to work hard during workouts. If anything, we often instruct people to pull back a bit on a workout if they’re going too hard. 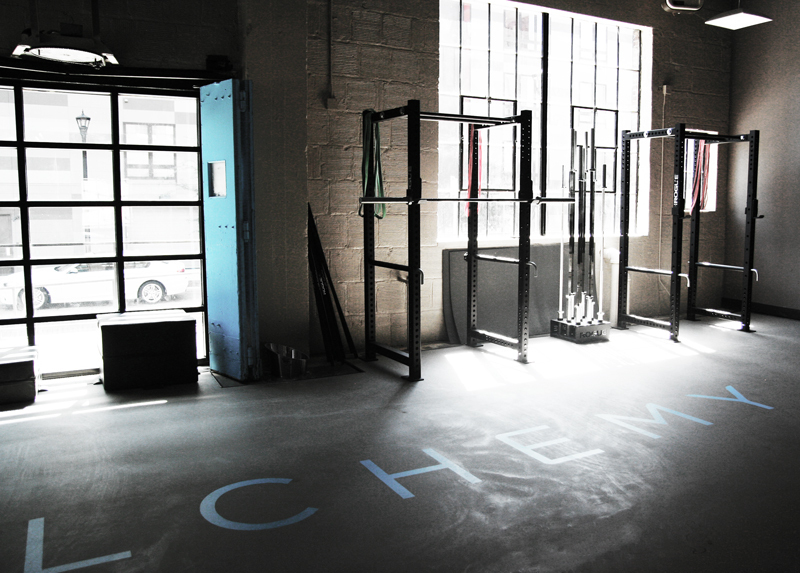 What makes Alchemy 365 different then other group fitness gyms? 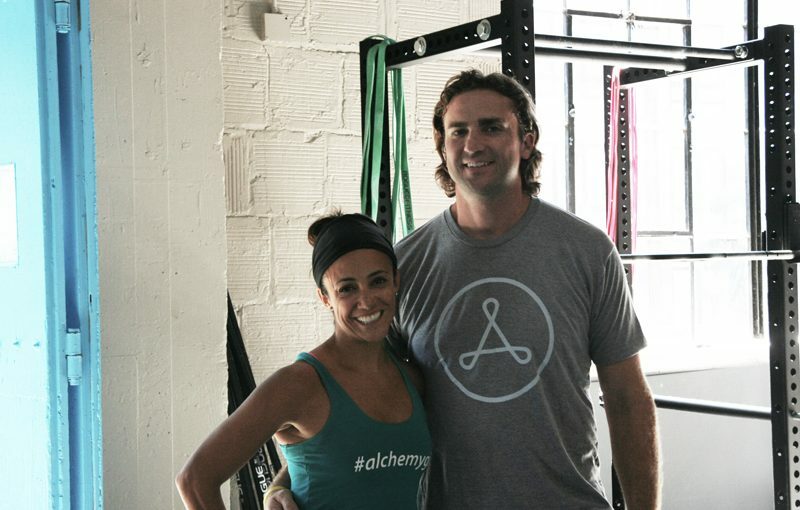 Mike: Alchemy is a complete fitness program that allows individuals to develop their fitness according to their goals by picking their class mix and intensity level each and every day. There are no gimmicks here, simply proven methodologies packaged in an innovative way that provides real results. The community environment makes people feel supported and wanting more. Many women are simply afraid to lift weights for the fear of getting too “bulky”, can you share the truth about this myth? Andrea: You have to work really hard to get there to be bulky. If you think you have a genetic disposition to gain muscle, than I truly think you are blessed! Being strong is something I believe more women should aspire to be. Mike: To be frank, a fitness program is lacking if it doesn’t include lifting weights, and by lifting weights I mean heavy compound lifts like the squat and deadlift. Strength training improves bone density, joint health, body composition, and confidence. For those who truly want to see their fitness level and body composition change, lifting weights is the most efficient and effective way to produce positive change on the body. Also to be frank, women getting bulky isn’t a myth. Women who have a propensity to build muscle who train extremely hard will develop significant muscle mass – and that’s awesome! These people are lifting heavy 4-6 days a week though and are eating enough to support those muscles. Strength training 1-2 days a week will not cause women to get bulky though. Mike: Being fit and healthy is a constant battle, one must find balance in the following areas – sleep, stress, relationships, active lifestyle, exercise, nutrition. Working on all six of those areas should be a lifelong endeavor, with periodic self assessments to see where one can improve. Imagine this, your family is living your most perfect day – What does this look like? Andrea: Friday mornings is usually the time where our family can all be together. We would all sleep in until 6:30am and start our day with our favorite meal, banana pancakes. We would take our time and walk the dogs together and enjoy the morning. We would be active, sweat and get a good workout in. There would be beautiful meals where we would all prep dinner together around our kitchen island. Now, what does your actual typical day look like? Andrea: Laundry, dishes, cleaning, early mornings, working hard and balancing time together. How do you balance running your own business, staying healthy, social life, being parents and looking amazing while doing it? Andrea: We work as a team. We both teach anywhere from 15-20 hours per week, Mike leaves the house around 5:00am and I am with the kids in the mornings and some nights I am not home until 8:00pm. Most weekends we have events that we are hosting or participating in and it is great to bring the kids and have them experience this life, movement is very familiar to them. We do our best to plan ahead, anticipate and be ready for anything. Mike: Every day is a constant battle. We have an elaborate sharing of child-rearing responsibilities during the week that would make most people swoon. To find balance we prioritize our workouts and make sure we get them in 3-4 days a week, we prioritize sleep over some social activities, we try to practice good meal planning by cooking batches on weekends to use during the week, and we focus on active activities when we’re with the kids. What is new for Alchemy 365? Where do you see Alchemy 365 in the next 2-3 years? Any big plans you want to share? Andrea: We plan on opening ten locations in three years and by our third year have a second market. Mike: We’re opening our second location in the St Anthony Main area this year! What an inspiring post! I’ve heard lots of ‘buzz’ about Alchemy but hadn’t yet taken the time to learn what it’s all about…and I’m glad I did. Perhaps it’s time I take that intro class? P.s. So excited to hear you’ll be expanding into the St. Anthony Main area… My neck of the woods! 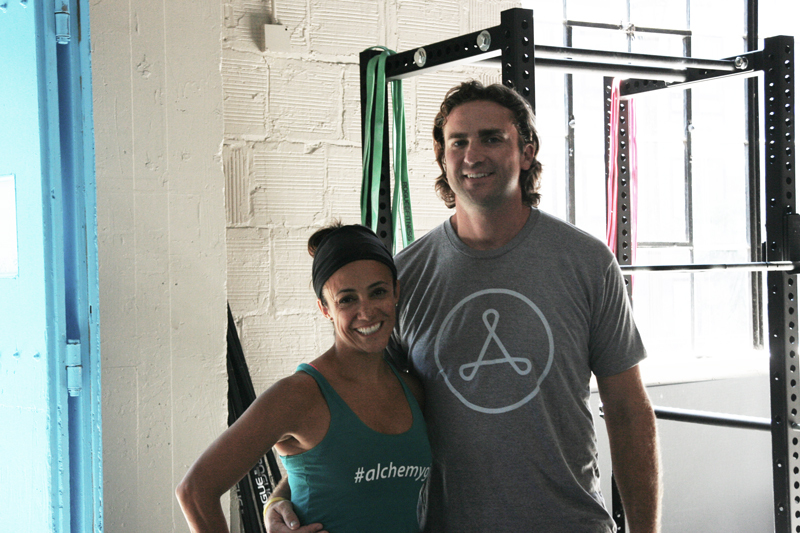 Gretchen, yes Alchemy is a must try! Please let me know if you go and what you think! I am glad that you enjoyed reading the interview! LOVE LOVE LOVE alchemy!! and love this duo! hope to see you there sometime! Thank you for sharing this. I have wanted to try this place. It is in my neighborhood but I have always been intimidated to drop in. Your write up on them helps a lot. Thanks for sharing! Stephen, you are welcome! I hope you have gone to check them out and enjoyed your experience. Be well!